Get to know the Asphalt Green staff better! We think our employees are amazing—and we think you’ll agree! 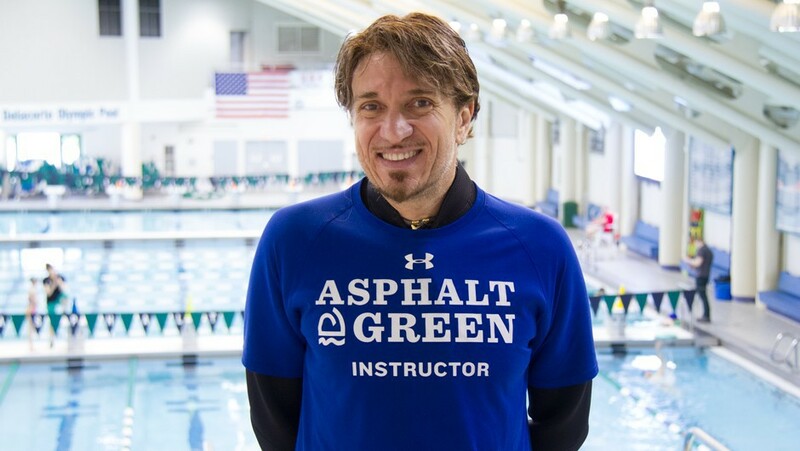 Learn about our top-notch team in the Staff Spotlight series on the Asphalt Green blog. Q: How long have you been working at Asphalt Green? A: I’ve been working at Asphalt Green for one year. I started last April and absolutely love it. Q: What do you do at Asphalt Green? A: I’m a swim instructor! I love teaching kids (and adults) to be safe and to enjoy the water. Q: What is your favorite aspect of working at Asphalt Green? A: I’m the kind of guy who needs to work with professionals, and Asphalt Green is full of professionals. I’m 45 years old, been doing this for a long time, and I’m still learning every day at Asphalt Green. I love it. Q: What is one of your fondest memories of working at Asphalt Green so far? A: There is one particular child that I work with in our Waterproofing group from P.S. 125 who has truly been an inspiration. When we first met, he was scared and afraid; his lack of English made it difficult to communicate, and he really didn’t have many friends in the class to look out for him. Slowly, I earned his trust, and with hard work and dedication, we were able to overcome his fears. He has come so far, and swimming has really helped his growth and development. He has bonded with the class and genuinely enjoys his time in water. Every time our eyes meet, I can see his appreciation – this is why I love doing what I do. Q: When did you start swimming? A: As soon as I could! I grew up in Italy, and my family had me in the water as soon as possible. Q: How did you get into the aquatics industry? A: I knew I wanted to be a swim instructor ever since I was very young. I was fortunate to have an incredible swim coach when I was a child; he was my role model and taught me to love the water. I was inspired to be like him. A: I love playing tennis. I also run a lot. Q: Who is your favorite athlete? Why? A: Francesco Totti. What can I say, I’m Italian! Francesco Totti is one of the most prolific soccer players to ever live. His game is magnificent! A: My wife inspires me. She travels the world and is the most knowledgeable person I know. In my humble opinion, she is an inspiration for all. Q: What is the best swim tip you’ve received or favorite tip to share with players? A: Stick with the basics. I’m not one for elaborate advice, but I also recommend that everyone continues to keep an open mind. Q: What is a fun fact about Cristiano? A: I actually owned my own restaurant in Rome for about seven years. At one point, I was cleaning the floors with chlorine-based bleach just to get a smell of the pool back in my life. It was inevitable that I would return to the water at some point.